Looking for lake view property? 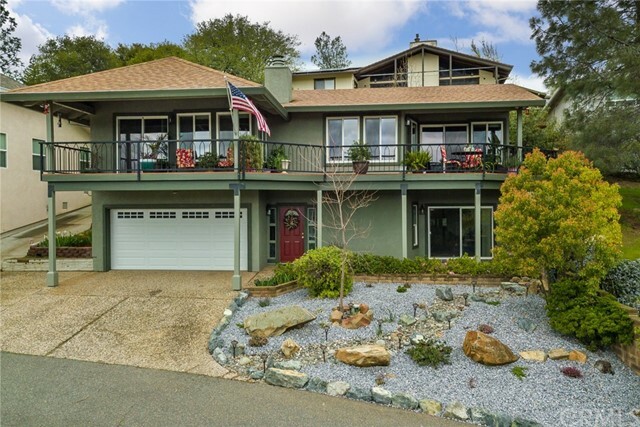 Well look no further...One of the first things you will notice is the breathtaking view of Lake Oroville. Once you've digested the view you will admire the beautiful low maintenance landscape. Upon entering the home on the ground floor is the first master suite with a private patio with amazing views of the lake. Adjacent to the downstairs bedroom is the access to the garage which has tons of storage space. The master suite upstairs offers a private patio where you could enjoy a cup of coffee with a sunrise or tea with a sunset. The open living space has a huge cozy fireplace, dining area and kitchen with granite countertops, and newer appliances. Down the hall is the 2nd bedroom which could double as a mother-in-law space, with a private living space/office space with private access to the back patio area. Just imagine the view of the fireworks display! There is an opportunity to purchase the vacant lot next to this property with the sale of this home. This one won't last long...ready for a new home owner just in time for summer fun!